Where was Jesus really buried? 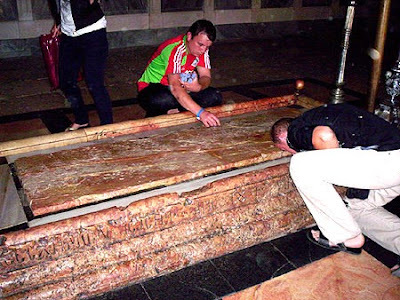 There are two particular sites in Jerusalem that claim the location of the Crucifixion and the temporary resting place of Jesus' body afterwards. The first to make that claim is the Church of the Holy Sepulchre which is located inside the current walls of the Old City. The second is the Garden Tomb which is located just slightly north of the Damascus Gate of the Old City. There are also some who would argue that the location could have been on the Mount of Olives, though there's not a strong case for this location. Typically, groups Lamb & Lion Ministries takes on a tour of Israel when they go into the Church of the Holy Sepulchre can really become turned off by all of the blatant idolatry and the suffocating darkness of the building. Whereas, the Garden Tomb is bright, airy and peaceful, indicating a more restful garden-like atmosphere. Much emotion is tied to both locations, but getting over the emotion of it all, where strictly from a scientific, archaeological viewpoint was Jesus crucified, buried, and resurrected? Dr. Fleming: May I quote one of my favorite sayings as a teacher which the student don't like? "Let me enrich you with a new uncertainty." You know, I am honored to be an archaeological advisor for the Garden Tomb, and it is one of my favorite places in Jerusalem to go to and reflect and pray. It deserves the sanctity. The Garden Tomb has, of course, a beautiful garden. It has a site that looks like a tomb within the garden. On the other hand, the Holy Sepulchre houses six different denominations, sometimes having services at the same time and in terrible competition with one another. It is hard to feel the Spirit of Christ there. Nathan Jones: The Church of the Holy Sepulchre houses the Catholic traditional sites of both the crucifixion and tomb. 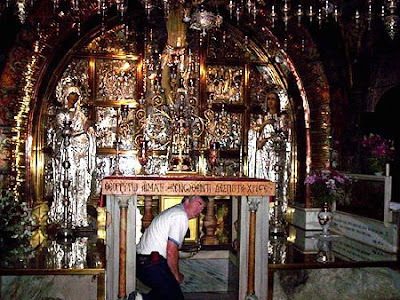 This spot is where Jesus supposedly was crucified. Nathan Jones: Catholics kissing the stone slab Jesus' body supposedly rested on after being taken down from the cross. While the architecture in the Church of the Holy Sepulchre is wonderful, the gross idolatry in the "church" rivals a Hindu shrine. Jerusalem Jews think of this when they think "Christianity." Dr. Fleming: I once while visiting the Garden Tomb saw an Armenian Orthodox priest who I recognized as working in the Church of the Holy Sepulchre, and there he was praying. After he finished his prayer, I went up to him and asked, "What's a nice Armenian like you doing at a place like this?" Listen to his answer. I think it reflects the view of many Christians. He said, "We might have the right place at the Holy Sepulchre, but for me this is a nicer place to remember it." Most evidences for any site's authenticity will fall into three categories: 1) geographical evidence, 2) historical evidence, and 3) archaeological evidence. The Garden Tomb has excellent geographical evidence. It was outside the walls of Jerusalem in the time of Jesus. It is also located along a major road that went both from Jerusalem north to Damascus and from Jerusalem east to the Mount of Olives in Jericho. The Romans liked crucifying on major roads. It has a huge water cistern within it which is too large for a house. It was probably for irrigation that would naturally go with a garden. The Garden Tomb has near it an Old Testament stone quarry that left a cliff, and most ancient quarries that left cliffs were reused as cemeteries because it is nicer to have a wall entrance to a tomb then a floor entrance to a tomb. A tomb is actually located there. The face of the quarry still looks like a skull. There are three reasons why it can be described as looking like a skull. 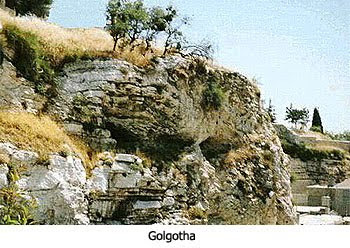 It is called Golgotha or Skull because it either looks like a skull, it is smooth on top like the top of a cranium, or skull skeletons were found nearby. Looking from the Garden Tomb, at a certain angle the facade of the cliff looks like a skull. Again, it is smooth on top like the top of a skull and nearby are tombs. The weaknesses of the Garden Tomb being the actual location of the Crucifixion and burial place of Christ are the second two: history and archaeology. By the way, the Garden Tomb staff are always very conscious to end every one of their little talks with the claim that they cannot be sure it is actually the tomb of Jesus, but that it is an empty tomb which reminds us of the importance of the Resurrection. They always say, "Wherever the tomb is, it is empty." Concerning the other two weaknesses of the Garden tomb, no one suggested the Garden Tomb until the 1880's AD. Many denominations were kicked out of the Holy Sepulchre, so if there was any memory of an alternate site you would think one of them would have gone to the Garden Tomb instead. Many of the holy sites, like the site of the birth of Jesus, and the site of the death, burial and resurrection were all selected by the mother of Constantine some 300 years after the event. The three main sites she picked were the Church of the Nativity, the Church of the Holy Sepulchre, and the Church of the Ascension. Those three fall under the three categories that her churches fall into. One is close, which is the Church of the Nativity. One is mistaken, which is the Church of the Ascension, though it is over a Jewish tomb from the time of Jesus. One of those churches is probably accurate, and I'll quickly summarize why all Herodian Period archaeologists I know feel that the Holy Sepulchre has good archaeological evidence. It is over a Herodian period tomb, which means it would have been outside of the wall during the Herodian period, though we don't know for sure where exactly that wall was. Now, compared to the Holy Sepulchre Church, we do know the Garden Tomb is indeed outside. If there is a Herodian Period cemetery, which means 37 BC to 70 AD, that would be the exact kind of tomb. Unfortunately, and it is hard for me to say it because I love the Garden Tomb so much, but it is an Old Testament style tomb in a line of Old Testament style tombs. Did you know that three feet inside the wall of the Garden Tomb is an Old Testament tomb with bones and pottery still in it from the Old Testament period? Remember then that Joseph of Arimathea's tomb was a newly cut tomb in which no one had yet been laid. Now, it is technically true that Mrs. Arimathea could have said, "Listen, Joe, I don't care if everybody else is making these fancy, schmancy Herodian period tombs. If you want me to be buried with you, you'll make them like they were in the Old Testament period." But, you see the point is it is near Old Testament tombs that still have Old Testament pottery in it. Helena, the mother of Constantine, was not an archaeologist. She was probably not even a historian. She even probably knew little of the Bible. She selected them by writing a letter which we have to her son the Emperor. It went something like, "Dear Consti, you'll be glad to know that the local believers say that they have received from their ancestors an exact tradition for where the burial of Jesus was. It is under the Venus Aphrodite Pagan Temple that the Romans built." Did you know that we have the names of all the bishops of the Jerusalem church from James the relative of Jesus in the book of Acts until Helena? Until 135 AD the location had a Jewish name because they were Jewish believers in Jesus. But, then the Jews had to leave Jerusalem, then so it went by a Gentile name. If there would be any site parents are going to pass onto their kids, it would be the tomb of the Resurrection for theological reasons. Sure enough, when they tore down the Venus Aphrodite site, they found what we now know is a Herodian period tomb. It is complicated, but it has all the characteristics of tombs in that very restricted period from 37 BC to 70 AD. The Garden Tomb is still the nicer place to remember Jesus' sacrifice for us. Isn't it great how the Garden Tomb reminds us that a body is missing? An empty tomb points to the deeper theological truth, that the spirit of the raised Christ is alive and well and dwelling in our hearts today. 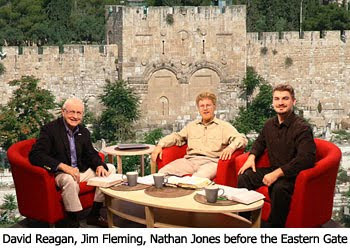 Nathan Jones: In 2007 there was a whole lot of to do over the supposed discovery of the tomb of the family of Jesus. James Cameron the famous producer and a film maker by the name of Simcha Jacobovici claimed this tomb, called the Talpiot Tomb, was the actual burial tomb of Jesus in their documentary The Jesus Family Tomb. They claimed since Jesus was buried, there could be no Resurrection. Dr. Fleming: Their claim has a very serious problem. When names are found on bone boxes called ossuaries, and there were ten bone boxes found in that tomb, to say just because there is a Mary or there happens to be a Jesus son of Joseph on one of them, and there was a Matthew and a Martha, that these specific names from the Gospels where very common names. About 75% of the people in the time of Jesus have either the names of biblical characters or have Hasmonean names, which are the Jewish family that drove out the Greeks in the Second Century BC. There were very few first names. The disciples shared their names with between 10-40% of the population during that period. A whole 7% of people were named Joshua, and more than that named Joseph. Simon is up at 20%! And so, Cameron's claim is just someone getting their exercise by jumping to conclusions in order to make a sensationalist documentary. Serious scholars would say there is no evidence that it could be the family of Jesus. Also, Jesus' family tomb would be in Nazareth, not in Jerusalem. Also, this tomb was no new discovery. The Israeli's discovered this in the 1980's and they didn't make anything out of it. What is most tragic is that one of the ossuaries contained a woman named Mary, who Cameron tried to show was Mary Magdalene and who was married to Jesus. One of the bone boxes held Judas son of Jesus, as if it showed Jesus and Mary Magdalene had a child. All of this is Da Vinci Code stuff, which this guy believes in the Da Vinci Code still. So, no, this wasn't a smoking gun after all. Ifn I hadn't seen your comment, I thought Nathan was banning me from telling any more fibs. Clicking and ticking, whooshing then ping I get the pdf to print and I didn't ask for it. ALL blooming day. Then it was gone, you came and it's back! ~~~ creepin in slowly - ssh, don't wake the blog dragon. TWICE I have been to the 'Church of the 'oly Sepulchre' and TWICE I caught blooming FLEAS, nasty little blighters. I hold the belief that the death, burial, resurrection, and ascension or Yeshua all occured in the same area, the Mount of Olives. The crucifixion would have had to occur on the Mount of Olives for the veil to be seen being torn assunder. The Garden Tomb would have had been in close proximity to the place of crucifixion, likely being the same Garden Yeshua visited often, the Garden of Gethsemane because the preparation for the Sabbath drew near. Joseph of the city of Arimathaea and Nicodemus were also familiar with this Garden, and prepared together the body of Yeshua for burial. It is said that Joseph was the principal owner of the Olive Press located at the base of the Mount and from this he accumulated his wealth and perhaps was owner of this Garden. Joseph was also a disiple of Yeshua and knew his great love for this place, even choosing to bury him in his own tomb within Gethsemane. The resurrection of course occured at this spot on the Mount of Olives. It is well documented that the place of ascension will also be the place of return, that being again the Mount of Olives. Let them have their shrines, the Word of God reveals the truth. The garden tomb is not far from the Damascus Gate outside the walls. Just off the Damascus Road -big and wide, near St.George's church, right next door to the bus station(unless it's been moved). P.S. The bus station is on the site of an old quarry - typical place of execution, lots of convenient stones. The tomb is very close, in what was a rich man's garden. Fleas?! Wow, missed them. Nope, I didn't kiss any stones or anything else for that matter at the church - yuck! I did observe an Armenian priest slap a woman really hard for showing up before the cross location in a tank top. If it had been my wife slapped, I would have started an international incident.